Congratulations Secret Avengers, you have reached a full year in giving us 12 issues of spy versus spy excitement. Issue #12 marks the end of the title’s first year and a new addition as Ales Kot joins Nick Spencer in writing the closest thing to a Marvel’s Agents of S.H.I.E.L.D. tie-in book we have. With the Infinity crossover behind us, will the A.I.M. vs. S.H.I.E.L.D. story return to the desired beats? “How to MA.I.M. a Mockingbird” picks up the story from two months ago as Mockingbird was presenting to the A.I.M. High Council. Morse discovers her topic is related to issues around Extermis, and asks for more time to fix the problem A.I.M. has uncovered (I wonder if A.I.M. and Centipede have the same issues). Elsewhere an overstrained Director Hill is interrupted by Coulson. He has a request for Hill to meet with a group of A.I.M. scientists which uncovers a schism against Supreme Scientist Andrew Forson within the villain ranks. The story ends as Fury leads the field team into an A.I.M. facility, Base Medusa the home of Forson’s Black Guard. Of course being part one of an arc, the story ends on a cliffhanger. And this is followed by a second cliffhanger as a classic S.H.I.E.L.D. villain is reintroduced to this book in the final moments. It has been over a year of Coulson in the comics. And I have often complained like Flynn Rider they never got his nose right! But now I think Spencer, with Kot, and artist Butch Guice are getting Coulson. Case in point, in his interactions with Hill he notes why she should listen to him on these A.I.M. agents that wish to speak to her. She is distracted with the whole Daisy Johnson situation (not seen in this episode). But his case for I am someone who should be heard fits the Coulson we know in the Marvel Cinematic Universe. But mostly importantly, his watch has hands. Guice shows us that Coulson’s watch is not a Ward digital electronic monster, but a classic watch with hands. I wonder if it has a radio in it? Agent Daniel is a happy boy. It was fine to see Coulson and Fury fighting the forces of Thanos and new Inhumans in New York. There was a lot of punching and shooting. But I really have come to like the intellectual espionage thriller that was developed. Two months has been a long time to wait to continue Mockingbird’s story! And I really want to know how and if Taskmaster and her will get off A.I.M. Island! For heaven’s sake I want to know if the Secret Avengers will figure out what Hill did! So I am thrilled the team is back writing espionage and not fighting. Taskmaster you are so enduring yourself to me! As a member of the A.I.M. High Council and a S.H.I.E.L.D. double agent he has henchman problems. I love watching him trying to support Mockingbird while trying not to seem too enthusiastic. Let us be honest, if she gets caught, he is also in deep. One of Guice’s images of Taskmaster giving a thumbs up is stuck in my mind, and though it is a small non-action frame it is my favorite of the issue! Espionage is back agents and I love it. 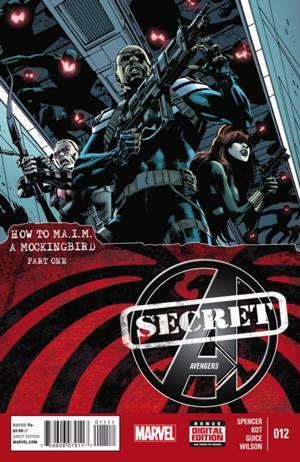 Welcome home Secret Avengers. You have given us nearly a whole year of Coulson. And you are getting the character, though it may help to see him on the small screen to flesh him out better. Honestly, I am ready for issue 13, mostly because I want to see where Daisy Johnson is and how Hill reacts to the classic villain who just walked through her door!